Jake Wood has it made. He is a tough homicide detective with a partner who’s like a brother, and he’s about to marry the girl of his dreams. Then Jake learns a close friend is missing and travels to South America in search of him. After a freak accident in the Amazon Rainforest, Jake wakes up in the hospital—eighteen months later. Long presumed dead, he discovers his fiancée is married and pregnant, his house was sold, his job is gone, and his partner transferred to another city to become lead detective on a serial killer case. Jake buys a cabin in the woods and tries to leave the world behind, until his home is broken into and he discovers he was targeted—but why? When Jake’s former partner requests his aid in catching the Blood Eagle Killer, he offers to help find whoever is behind Jake’s recent trouble. This leads to Fortech Industries, a pharmaceutical company secretly researching a way to create an immortal gene. Now they intend to destroy their only error—Jake Wood—who has become something more than human. 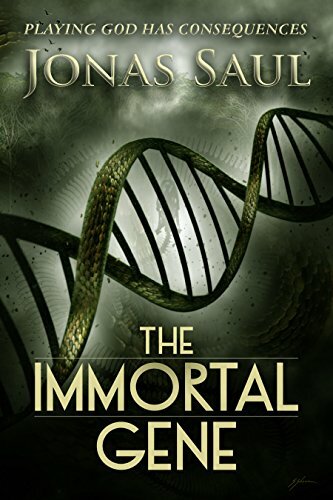 The post <p style="text-align:center;font-weight:bold;">Author Jonas Saul doesn’t shy away from the elements that make this a scary, violent world, and in return the reader is rewarded with an awesome sci-fi/suspense page turner: <em>The Immortal Gene</em> by Jonas Saul</p> appeared first on Kindle Fire on Kindle Nation Daily.